I always have mixed feelings when watching a sequel. Will it live up to my expectations, or is it just a cheap knock off that relies on the success and perfection of the first part? Will the characters and storyline evolve or will it be stuck? I can gladly say that I was not disappointed. Besides the many children that were brought in by their more than irresponsible parents – including one kid behind us that pooped his pants – I loved this sequel. It was creepier and even more disturbing than its predecessor. The story took a few turns and kept me on the edge of my seat. 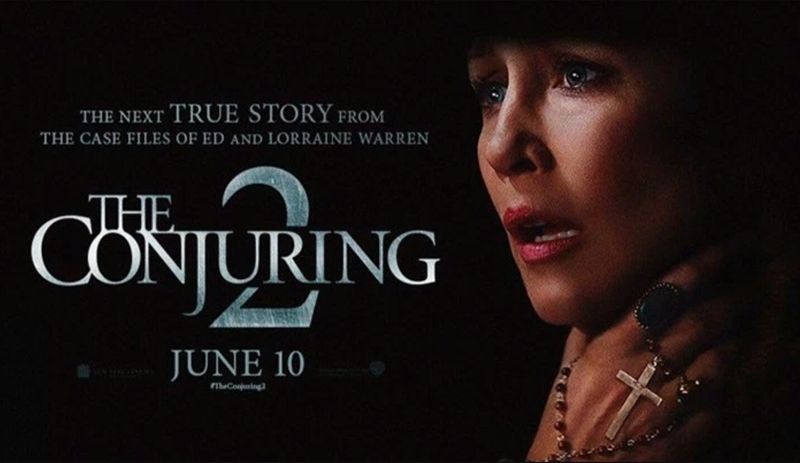 In this chapter of The Conjuring based on a true story, Ed and Loraine Warren are called to England where a young girl seems to be possessed by an old spirit that used to live in her house. While Loraine – troubled by visions that involve a terrifying spirit and her husband Ed – would rather take a break from catching spirits, Ed is convinced that they have to help her. The Conjuring 2 makes me crave for a third part. But I am almost convinced it can’t get any better. James Wan has very much evolved and even uses CGI effects in this movie, however doesn’t overdo it. He delivers the right amount of almost everything. One thing I was missing or looking forward to was seeing more of the struggle Lorain was experiencing regarding her faith. Judging by the movie cover I thought it would play a bigger part and feel like I interpreted too many things into the movie that weren’t even important at the end. All the actors were cast perfectly. The storyline was great. The setting was terrifying. There wasn’t a dull moment. I was very very happy with the outcome. All I was missing was a little more depth for Loraine’s personal story. But hopefully we’ll get that in part 3 which I am sure is happening. James Wan didn’t disappoint. Thank you for bringing an R rated horror movie that is neither predictable nor relying on gore and cheap CGI effects.